Unit studies take a theme or topic and incorporate all or many different subjects into that topic (language arts, history, geography, science, arts, etc.). They are a popular way of organizing homeschool studies and are compatible with many homeschool methods. 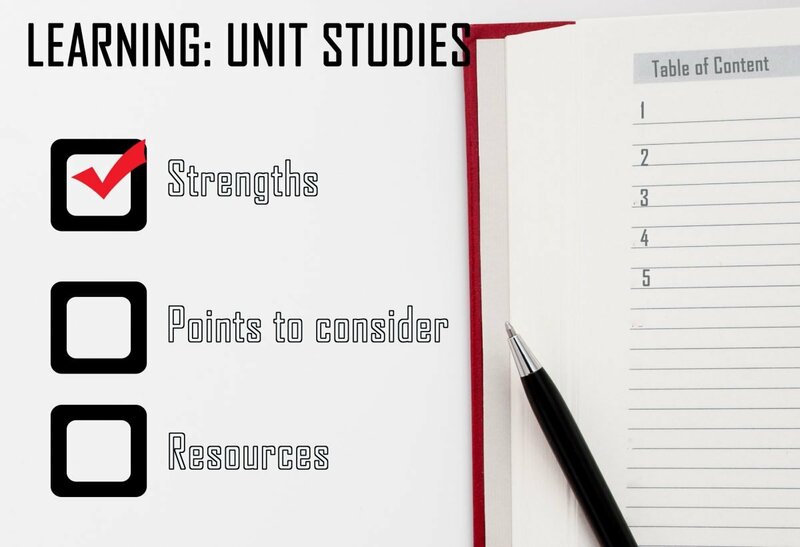 Unit studies can be created by the teaching parent, but there are also many prepared unit studies available for free or purchase. Purchased unit studies are sold as separate studies, or as part of a complete curriculum program. A typical homeschool day using a unit study about Ancient Egypt might include: reading books about Egypt (history); making a salt dough map of Egypt (geography); exploring why the area around the Nile was so fertile (science); calculating the height of a pyramid (math); watching “Prince of Egypt” (cultural studies); learning how to spell “pyramid”, “ancient” and other related words (spelling); creating a page with a picture of a sarcophagus and a short written description (art, handwriting and composition); and, listening to a bedtime story set in Egypt (literature).